As much as I love the Celine shopper, I'm pretty smitten with the backdrop too. The varying heights, the layered portraits in a collection of frames, etc... I like the way it feels timeless. What say you lovelies? Oh yes! Love the way it's styled! Ugh. Gorgeous!!! That bag is stunning and the backdrop is beautiful! I LUV the elements individually, but I have to say I find the whole backdrop too cluttered. Perhaps not something I could live with... as a display of merchandise thought: I do find my eye is straight to the stunning bag! So if that's the intent, that's good I guess! Love the bag!!! I find the background a bit cluttered for my liking but I love the layers if they were spread out bit. I love the bust, the candles and the stacks of magazines. What caught my eye are the bricks! Brings back memories of my husband and my first apartment, when all we could afford were planks and bricks for shelves. This photo makes that look so chic! 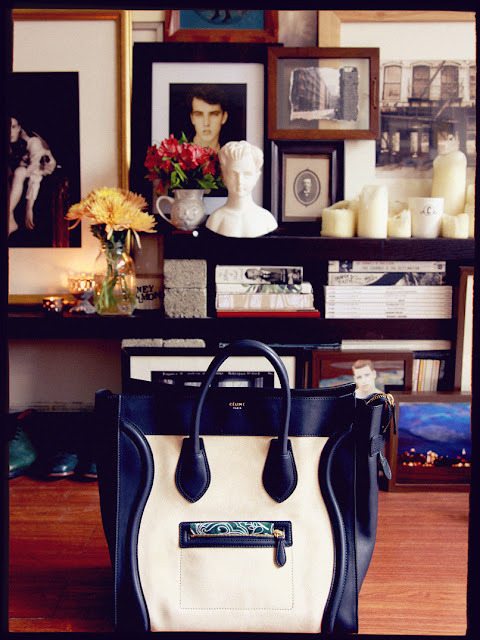 The Celine bag is perfection! The Shopper is perfection in the form of arm candy. I love the leather and linen combo after having seen a few guys rocking the "murse". But what I loved more was meeting you last night. You seriously are a blast of awesomeness wrapped in an awesome outfit. I hope for many more encounters!! !